Inscription note: Copy of a letter from Turner which accompanied the gift of this portrait. 'Jackson' is a reference to the painter John Jackson, from whose posthumous sale Turner bought this drawing. Presumably Jackson had borrowed it from Flaxman's collection (perhaps even after the sculptor's death in 1826) to assist him with the painting of his posthumous portrait of Eliza Soane P148. Inscription note: This inscription has been misread as 27 September '1810' and incorrectly given as the date of the drawing. It is in fact 1830 and is the date of the gift of the drawing to Soane. This is a charming portrait of Soane's beloved wife Elizabeth (Eliza) Soane, drawn seated on a chair, perhaps sketched after tea or dinner at an informal gathering, by their close friend the sculptor John Flaxman. Her costume seems to indicate a date of c.1795-1800. 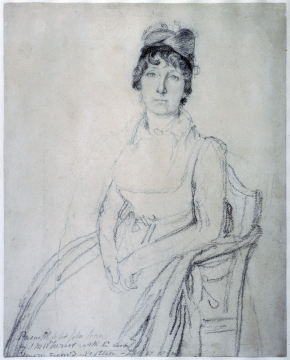 It is one of the three pencil drawings by Flaxman used by John Jackson as models for his posthumous portrait of Mrs Soane, commissioned by Soane (fifteen years after her death) in 1828 and left unfinished at the artist's death in 1831. A few months later the drawing was presented to Soane as a gift by his friend the artist J.M.W Turner on the occasion of Soane's knighthood in September 1831, Turner having bought it at the posthumous sale of Jackson's effects. Under the drawing hangs a wooden tablet bearing an epitaph in French Chère amie, je ne peux plus entendre ta voix - apprends moi ce que je dois faire - pour remplir tes souhaits! ('Dear friend, I can no longer hear your voice - teach me what I must do - to fulfill your wishes!'). The same inscription is on the canopy of the model of the Soane family tomb in the Library-Dining Room. The Museum's ex-Librarian Stephanie Coane, identifed this quotation and the following is an extract from a short article she published in the Museum's Newsletter. 'The passage is from Corinne, ou l'Italie by Madame de Staël, first published in 1807: O toi! dit-il en s'adressant au portrait de son père, toi, le meilleur ami que j'aurai jamais sur la terre, je ne peux plus entendre ta voix: mais apprends-moi par ce regard muet, si puissant encore su mon ame, apprends-moi ce que je dois faire pour te donner dans le ciel quelque contentement de ton fils. (Thou, the best friend I shall ever have on earth, I can no longer hear your voice; but tell me by your mute gaze, still so powerful to my soul, tell me what I must do to give you in heaven some satisfaction in your son). Although little read today, Madame de Staël, the only daughter of a Swiss banker, was a major intellectual figure of the early Romantic period, described by Byron as 'the first female writer of this, or perhaps any age', and well known for her opposition to Napoleon, who exiled her. Her second novel, Corinne, was an immediate and huge success across Europe for its portrayal of a new style of impetuous yet emotionally vulnerable literary heroine and as a romantic travel guide to the Mediterranean. There are two copies of the book in Soane's Library. .... Soane was not a great reader of novels but may have been attracted to Madame de Staël's book as a modern sentimental journey promising descriptions of the destinations of his own grand tour decades earlier. This passage in which Corinne's Scottish lover Oswald addresses the portrait of his father must have struck Soane, who as a keen lifelong student of French was easily capable of abridging it to suit his own needs'.